SPCK Assemblies - Well thankful! 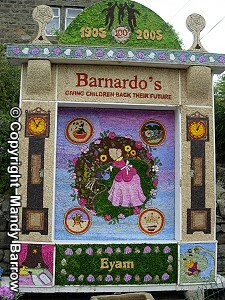 To use the tradition of well dressing to remind the children of the importance of being thankful. Gather some gifts that would show you were thankful to someone, such as a box of chocolates, flowers and so on. Try to think of a reason to say ‘thank you’ to a member of staff in the school – for making you a drink each day or helping you in any way or saying something encouraging to you, for example – then you can give the flowers or chocolates to him or her during the assembly. Ask the children if any of them have said ‘thank you’ this morning – ask them to share those times with the other children. Ask the children if they can think of different ways to show that they are thankful. Recall the reason you thought of to say thank you to a member of staff to the children. Give the person the gift and thank him or her in front of the children. Ask the children how they think the person felt when you said thank you. Ask them if they can think of a time someone has said thank you to them and made them feel good. Explain that, for many years, people in some parts of the country have showed their thankfulness for water by doing something special. – the final, sixth, link above shows the Barnardo’s charity, which cares for children – note the name ‘Eyam’ at the bottom. 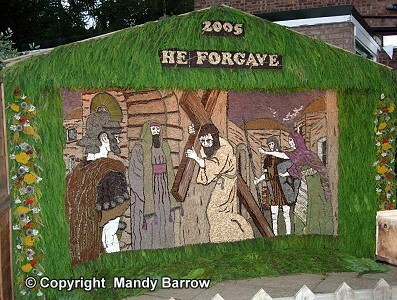 Explain that well dressing takes place in many villages, but it originated in Derbyshire. It is thought that it began as a way of saying thank you to God for the purity of the water coming from underground springs during the time of the Great Plague – the Black Death. At a time when people were acutely aware that the disease could be passed on from person to person very easily and could be carried on objects touched by an infected person, it was considered of vital importance that the water from the springs (wells) was clean, fresh and uninfected. When the Great Plague was over, to celebrate this, people would ‘dress’ the wells or other springs on a specific date in the summer. Church services of thanksgiving would then be held near the water supply. When clean water began to be piped to homes and people no longer needed to go to wells, some villages continued with the tradition of well dressing and, today, prayers of thanksgiving are still often said close to the wells. Explain that the decorations are made from wooden frames that are covered with clay and a picture sketched on paper is traced on to the clay. This picture is then filled with petals and moss. Many pictures show scenes from the Bible, but some show charities (such as Dr Barnardo’s mentioned above), summer scenes and so on. Point out the word ‘Eyam’ (pronounced ‘ee-um’) at the bottom of the well dressing shown in the last image. The village of Eyam is well known as it cut itself off from visitors during the Great Plague in 1665. The dreadful disease had been brought to the village on infected cloth delivered from London and, as soon as villagers began to die, all the villagers agreed that no one would leave the village until the plague was over, to avoid spreading the disease. About 260 villagers out of 350 died. Despite the horrors of the Great Plague, the villagers were still grateful for clean spring water and still continue the tradition of well dressing. There is a verse in the Bible, ‘give thanks in all circumstances’ (1 Thessalonians 5.18). Even in bad situations, we can still find a reason to be thankful – just like the people in Eyam, who pulled together during a really hard time. Are we people who say ‘thank you’ easily? Are we people who look for the good in any situation? Can you think of something that you should have said thank you for? Are we people who take everything for granted without realizing how fortunate we are? Let’s make an effort today to look for something good in every situation. Thank you for the world we live in. Thank you for our family and friends. Thank you for our food and our clothes. Thank you for everything we have. Even when things go wrong, please help us to see the good in every situation. Please help us to remember to say ‘thank you’ and to have thankful hearts.